Memphis, Tennessee (CNN) -- It's been cold for Jacqueline Mosley. So bitterly cold you can see her breath as she speaks inside her home where power has been cut off for almost a year. She's been wearing hat, coat and gloves inside, struggling to stay warm by burning charcoal and huddling by her propane heater. Mosley, who is 59 and unemployed, has been living without utilities since last February, when she couldn't pay her $3,009 bill. Pointing at a shelf in her living room full of various fuels and lighter fluids, she admits that sometimes she uses dangerous methods to stay warm. "When you are trying to survive, you're not thinking about that hazard. You're trying to survive," she said. "I never thought that this would happen to me with the bill that I have, and no way to pay it. It's not that I don't want to pay it, it's not that I have a dispute with my bill, it's that I can't pay it." Memphis is in the grip of its most profound cold snap in over a decade, and it's likely going to continue through the weekend. The extreme cold has already contributed to hypothermia-related deaths of at least three people in the greater Memphis area. While only about 1 inch of snow is expected to fall, bitter cold temperatures predicted to reach close to zero degrees Fahrenheit by Saturday morning has authorities concerned and preparing for the worst. I simply don't have the ability to compare the threat to human life to some dollars. Relief for Mosley came at the behest of Memphis Mayor A.C. Wharton, who says 1 in 5 residents in Memphis are trapped in poverty as they continue to struggle and suffer from the same economic woes that are plaguing the whole country. Wharton says coping with these record low temperatures is a matter of life and death for many people here who are dealing with major financial troubles. "We know through our records that we have terminated utilities needed to keep people alive. I'll walk out of this job before anybody tells me that because these folks haven't paid a bill, that they will just have to sit there and tough it out," Mayor Wharton said. Wharton helped spearhead an agreement between the city of Memphis, Shelby County Government, and Memphis Light, Gas and Water to restore utilities to roughly 500 residents who previously had been cut off. "This is a situation in which I simply don't have the ability to compare the threat to human life to some dollars over here, " Wharton said. His plan is to use federal funds received through energy grants to help pay some of the costs, and says that residents are not getting handouts, but will be expected to repay the full amounts for their utility services using payment plans when they are able to. Mosley got the power back in the house where she was born in North Memphis on Wednesday. She'd moved back two years ago to care for her dying mother and is now frustrated that she, an experienced administrative assistant, has not been able to find work. "All I want is a job, I don't care if it's beneath what I used to do. I don't care. As long as I can take care of myself," she said. But that was temporarily forgotten when she became ecstatic at the opportunity to sleep in a warm home with even colder nights on the way. "I'm just so glad that tonight we will be in the house and have heat," she yelled with a huge smile. 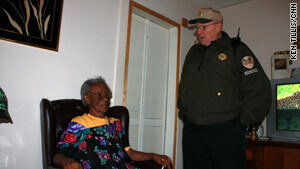 Bobby Stoddard checks on 88-year-old Ida Coleman. Memphis officials also are concerned about the safety of their elderly and homeless populations. Across the city, overflow shelters and beds have been added to accommodate the influx of people who need to get off the streets. And volunteers from the Special Services Unit with the Shelby Sheriff's Department are making extra efforts to check on seniors and make sure they are prepared. "It's important that we come out here and check these people and make sure that they aren't using improper space heaters, that their houses are warm, and that their utilities are still on and functioning," said Bobby Stoddard, whose special services group includes 31 volunteers and usually checks 700 houses per week in all conditions. 84-year-old Mattie Howze looks forward to the weekly visits from Stoddard and his crew, which she has been receiving for over two years. She knows it's important to take their advice during the frigid winter months. "I'm prepared for the worst, and have my pipes wrapped up. I feel like I'm going to be safe." And with potentially deadly conditions, Memphis officials hope all of the preventive measures they are taking will help others be safe as well. Wharton insists he will do everything to help his residents have heat, regardless of the cost. "We don't think in terms of dollars, and to me quite frankly it was a no-brainer."